I always wanted to grow out my hair but unfortunately due to my hair being so fine and silky I am unable to grow past the shoulder length. 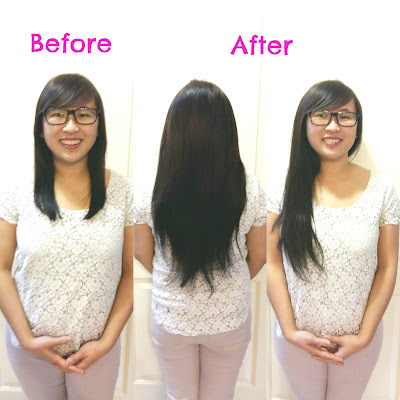 Do you also have fine, silky hair and want to get a fuller, longer hairstyles? This might be a solution to consider. 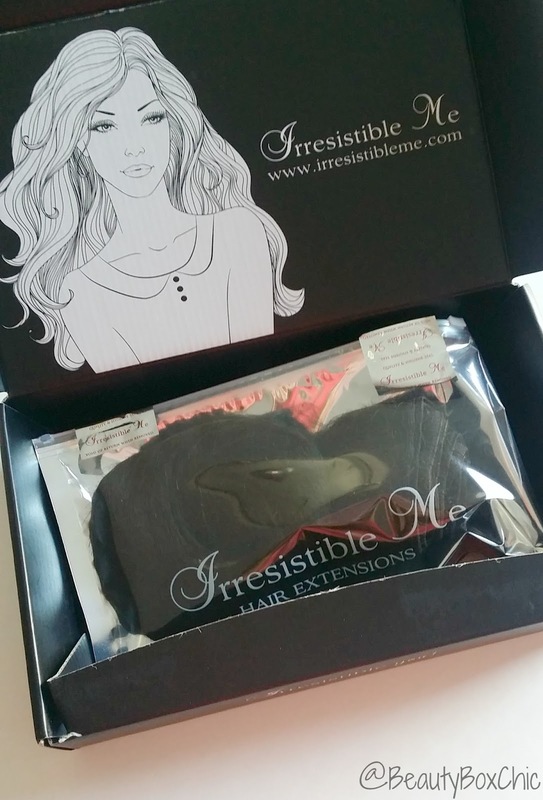 Today, i am so excited to share with you my thoughts on Irresistible Me Hair Extensions. 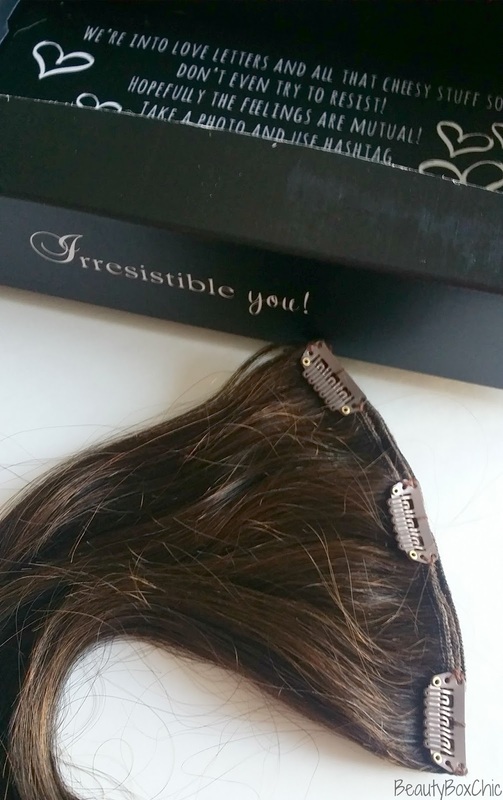 Special thanks to Irresistible Me , I was given the opportunity to try out their Royal Remy 18" 200g Chocolate Brown hair extensions . Here is a quick review for you all! What is the difference between Silky Touch vs. Royal Remy? • Silky Touch line is one of Irresistible Me best-selling line, it is made with 100% human remy hair perfect for someone who loves to add a bit of volume or length to their hair occasionally. This is my first time trying hair extensions, I am very pleased and satisfied. I really like how it come in a packaged where it give you a sample sized (left portion) for one to first try it out and test the length, color and see if the extension is something you want and looking for. If the color and length doesn't match your hair color, as long the (right portion) is unopened, you can return or exchange no question ask. 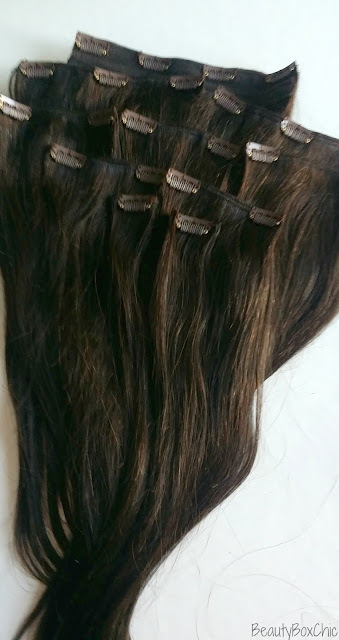 I got the Royal Remy 18" 200g Chocolate Brown hair extensions ,in the packaged it come with a 10 pieces hair clips. It includes: 1 piece of 4 clips (7.5"), 2 pieces of 3 clips (6"), 5 pieces of 2 clips (4"), 2 pieces of 1 clips (1.2") (see the above and below pictures). 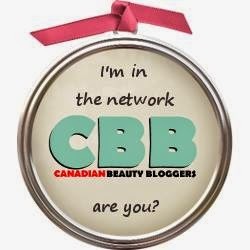 • Irresistible Me offer many helpful tips & tools for their beauty customers to go over prior considering their products, check out their fact sheet and youtube channel for more details. 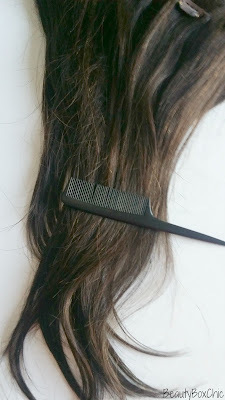 • Royal Remy hair extensions is extremely silky and soft, it create a natural look!!! • Chocolate brown shade match my hair colour so well, it blend in perfectly!! • It can be quite expensive. However, they do offer promotion code to their customers, check below on their current discount code. Irresistible Me is offering 20% discount on your first order, click here for details. This is my first time using hair extensions. I honestly really enjoyed using this product and it looks amazing on me. Not only does It create a natural look and blend-in very well with my own hair. The extensions is also very silky and give me the volume and length I been dreaming off, I really love how it turns out. I can not wait to style or curl these extensions and wear it to school, to work, to a party or even for everyday wear. What do you think of Irresistible Me hair extensions? Would you give it a try? Comment below. I love to hear your thoughts. I have STRONGLY considered getting extensions for a while now, but it's so expensive and I don't know if I am ready for that expense on top of my keratin treatments. Wow that looks seamless! It would be fun to do every once in a while to just have some fun with it. Maybe get a different color than your real hair. Your hair looks so natural. I've seen extensions before and you could totally tell they weren't the girl's hair. 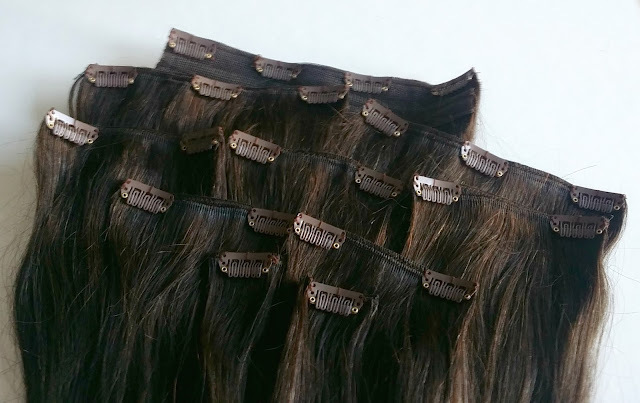 These hair extensions look nice and natural. It would be a great gift idea for any woman. Love your hair extensions! I have some of those and I love them! They look so real!! I have never tried hair extension but that is a neat way to have a longer hair and different look! Oh my gosh, mine doesn't grow longer than either. IT makes me crazy! I need to try some hair extensions. Your hair looks gorgeous. I have never used a hair extension before. I would love to try. How cool! I would love to try hair extensions one of these days and experience having a much longer hair like that. These look amazing in your hair. I have always wanted to try extensions. My Daughter wears them all the time. I've never tried hair extensions before, but have wanted to. Those are so pretty! I love the color. Oh wow. Amazing. I always want to try extensions! But I know how important it is to get nice ones so I am never really sure what brand to go with. Thanks for sharing. I never thought about wearing hair extensions, but it would be fun just to try and do my hair in different styles. I like the color, thank you for sharing! I've never used hair extensions before but these look great. I hope to try them! Wow, that is really cool. It looks great too. I can't even tell your wearing them in your after photo. I have never tried hair extension but that is great way for longer hair!! Holy cow, I've never tried hair extensions before but I might have to now. That looks way better than my real hair when it's long! They look really nice and natural, I keep saying I want to try hair extensions. It looks sooo gdooodd on you! I'm impressed with how natural these look on everybody! I would love extensions. These look great and so natural on you.